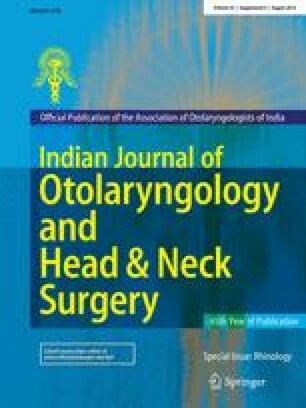 Nasal turbinate hypertrophy is a major cause of nasal airway obstruction that affects up to 20% of the European general population. This study aims to determine the efficacy of radiofrequency treatment as perceived by patients during a 2-years period. From 2007 to 2009, an observational study was conducted on 36 patients who consecutively underwent temperature-controlled radiofrequency tissue volume reduction. A questionnaire was administered to each patient in order to collect demographic data, lifestyle habits, health status and visual analogue scale (VAS) score of perceived symptoms. Mean VAS scores of nasal obstruction, headache, rhinorrhoea and anosmia after treatment were significantly lower than that at baseline. Urban residence and allergic rhinitis were significantly associated with lower mean improvement (2.9 vs. 5.6; P = 0.04 and 2.3 vs. 5.3; P = 0.01, respectively). A non significant association with scarce nasal obstruction improvement was present in older aged patients, in patients other than students and in active and passive smokers. Our data enrich the general knowledge on radiofrequency treatment of turbinate hypertrophy identifying the rate of long-term efficacy of radiofrequency treatment as perceived by patients and focusing on several risk factors involved in patient prognosis after treatment.